This action-packed, man-candy, popcorn flick was a great way to kick off the summer movie season. It roared at the box office, hauling in an estimated $87 million opening weekend. Hugh Jackman did an outstanding job reprising his role that put him on the map as the incredibly studly, rippling with layers of muscles, Wolverine! 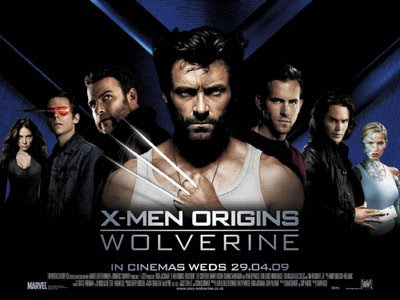 X-Men Origins: Wolverine tells a story of Wolverine's epically violent and romantic past. The story isn’t about how Wolverine got his mutant powers, but how the man Logan became a mutant who uses his extra special abilities - steely claws - to fight the good fight. Wolverine is all about doing what's right despite his early upbringing with his brother who sadly enough does not share the same moral code. We get an insight in his complex relationship with his brother Victor Creed/Sabretooth, and the dismal Weapon X program. Along the way, Wolverine encounters many mutants, including a couple of really cool and interesting new characters that we sadly didn't get to see enough of. Gambit, John Wraith, The Blob, and Wade Wilson are in and out way, way too quickly, which is a shame because I would have liked to have seen more of those characters interact with Wolverine. The action scenes were pretty spectacular, in particular one involving a helicopter, some Humvees and Wolverine on a motorcycle. I actually felt a little winded after it was over, that's how well it drew me in. The special effects were, as expected, large and very well done. The only real time the CGI looked fake was when Wolverine was looking at his newly implanted steel claws in the mirror, but that wasn’t a big deal. I did however feel there were a couple cheesy scenes involving Wolverine's anger, but again those parts were small and didn’t detract from the movie too much. Those familiar with the X-Men comics will have a very different viewing experience from those, like myself, who only know X-Men from the films. X-Men comic fans have been saying this movie was awful and insulting to the comic books. Be that as it may I thought it was pretty good. It ended very smoothly and does a great job setting up where the first X-men film started; or perhaps another Wolverine adventure before he meets Professor Xavier and the X-men. P.S.Marvel Studios has a habit of hiding little treats here and there in their films and Wolverine is no exception. Turns out they did it again by adding multiple secret endings on different prints, so movie theaters all over will be showing different versions. I love how you write. And "man candy" is the right description. I do want to go see this but I think i will wait to watch it on my big screen.